I get that it's not officially designated as controlled-access or even limited-access...nonetheless, that is how it currently functions. The single lane narrowing was done based on traffic volumes for safety reasons, instead of having 4 lanes with no shoulders in a narrow tub with concrete walls. There are Jersey barriers blocking the lane directly under the overpasses, so instead of 4 lanes you now have 2 lanes with no shoulders in a narrow tub. It feels trippy seeing the likes this forum way way to much thing without a photo above it. Looks weird. Along those lines I’m curious how these maps listed the US 5 “roadway” (for lack of a better term) in West Springfield that roadwaywiz calls the “West Springfield Expressway”? Both Rand McNally and National Geographic (similar cartography as the old American Map and RoadMaster/GeoNova/aligned-with-Mapquest atlases) show 5 as freeway south of US 20 and multilane north. AAA shows all of 5 in Springfield as simply multilane. Since you also mentioned them, RMcN and NG also show 116 in Amherst as freeway (AAA doesn't). Only NG shows Storrow Dr as a freeway...and that only west of where MA 28 splits off onto Beacon St. So the state put the Keep Right sign in when they rebuilt route 114 (back in the 80s) and then the Town of Danvers didn't want to inconvenience people on MacArthur Blvd. This is not a good idea. I'd expect this kind of weird sign in Peabody, but I thought Danvers knew better. Hope no one is coming the other way. Bring on the lawsuits! The "two way traffic both sides" thing should really not be in force on the section where it meets route 114. Fortunately it's probably a low-enough traffic street and residents know the pattern. Who's going to be able to parse the conflicting signs when also trying to watch for a break in the heavy traffic on 114? I like (don't like) that exiting traffic the "wrong way" (using the left-hand roadway) doesn't even get a stop sign. At least a stop sign facing that traffic would be a cue to entering traffic that there could be exiting traffic. The island-mounted keep right sign just makes you think this is a normal dual carriageway with one-way roads. Location: New Britain, Connecticut, U.S.
Aaand then you get parking like this. Is anyone aware of new exit ramps being constructed on I95/128 in Waltham? I have seen some small houses/business being torn down right around the Rt 117 overpass, and one business recently closed with the notice that their structure was being taken over due to construction of an "egress" (their words). Haven't seen or heard of anything on the Mass DOT website. Just curious as to when construction will start, and what the design will look like. That area is a tremendous bottleneck as it is. I can only imagine how bad it will get. Sorry if I missed this, but what’s up with the Caltrans style exit only messaging on the new I-95 signage? Well sort of. As we know Caltrans uses patches for exit only scenarios. They use simply “only” for freeway-to-freeway interchanges and “exit only” otherwise. The latest public meeting about exit 2A on the turnpike happened, and as expected, some people in the hilltowns are not enthused about building an exit inbetween 2 and 3 on the Masspike. The state has narrowed the choices down to Algerie Road, the Blandford maintenance facility or near the Blandford service plaza, and some of the cost estimates were revealed to be in the 30-35mil range. While I can understand opposition to the Otis proposal, either one of the Blandford ones needs to be done. Eesh. None of those locations seem very helpful to me, but terrain is an issue east of the Plaza (I still wanted one at MA 8, but that would be too far west to help out with Exit 3 traffic). Maybe the best would be at the Plaza? My personal opinion is that the service plaza area is the best compromise. The service plaza and maintenance facility are only two miles apart, the distance/convenience is kind of a wash between the two. The majority of the movements are likely to be getting on the turnpike westbound and exiting to Blandford eastbound, and for that the service plaza is the better choice. There's always got to be a quote from someone saying they don't see the need, doesn't there? Of course, whether one specific resident sees the need doesn't go one way or the other to show whether there actually is a need. And in public discourse, there is approximately a 0% chance that, when someone says they don't know something, they are inviting you to inform them of the thing they don't know. There's a 30 mile gap between Exit 2 and Exit 3. Does anyone know why those who planned and constructed the Massachusetts Turnpike left such a long gap between the US 20 (Exit 2) and the US 202/SR-10 (Exit 3) interchanges? Was it the lack of development in-between those two interchanges? The population density and movements at the time were not enough to warrant having staffed tollbooths. Now, in the era of AET, in-filling some ramps will cost a lot less money over time. To some that is a feature, not a bug. There was a proposed exit in there for the CT/MA 8 expressway, but environmentalists shot that down north of US 44. Do the lay people have their own solution? ^ Many of them probably see this new interchange as a "solution in search of a problem". Well, these 3 options seem to be designed more for local traffic for long distance traffic. It does nothing to make things easier for traffic coming up from western CT on Route 8 bound for the Capital District. My question is if MassDOT has ever considered making Exit 1 a full interchange now that the toll plaza is gone. That would at least make a somewhat convenient option for traffic to and from the west that would otherwise be forced to use Exit B3 or Exit 2. There has been discussion about upgrading Exit 1 to full interchange, but no actual plans from MassDOT on public record. It would certainly be a far lower priority than filling in the 30 mile gap. 1. Get westbound turnpike traffic from Westfield and eastbound traffic to Westfield off of exit 3 and out of the center of Westfield. This is probably 70% of the push for this interchange. 2. Prevent excessive backtracking for towns in that 30 mile gap from either Lee or Westfield. This is related to #1, but a different set of traffic. 3. Allow easier access for emergency vehicles and to allow people to turn around without having to go all the way to Lee or Westfield. Traffic from Route 8 to the capital district is probably very low on their list of priorities. An exit by the US 20/MA 8 junction would be too far west to be useful for the above three priorities, and since it's only 6 miles from exit 2 to that junction, probably not much of a time saver. I can't think of other exit placements that would take significant time off of such a trip. Exit 2, 20 to 8 is most likely the fastest, most efficient route. Without a US 7 or MA 8 expressway, time savings would be minimal. Or Albany-bound passenger car traffic can go west a wee bit and give the Taconic SP some love. Hopefully, when and if they decide to place the new interchange, it will not be known as Exit 2A but will be given a mileage based number. 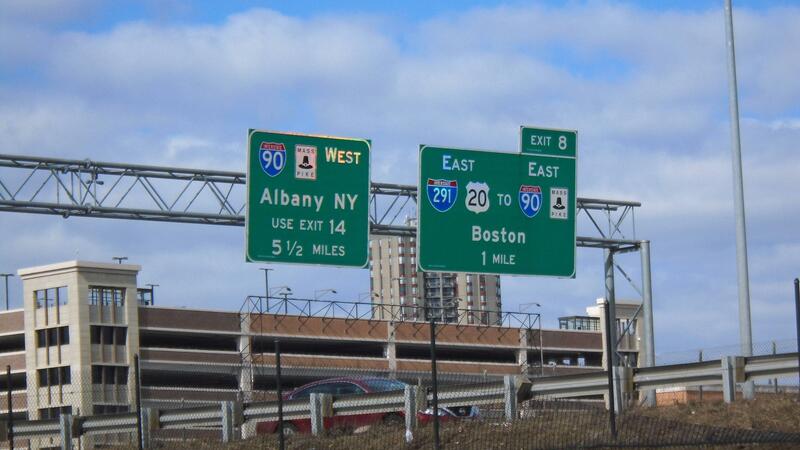 The new interchange can then be the excuse MassDOT could use to at least convert the Pike to mileage based exit numbers. Hopefully, when and if they decide to place the new interchange, it will not be known as Exit 2A but will be given a mileage base number. The new interchange being the excuse for MassDOT would use to at least convert the Pike to mileage based exit numbers. I may have posted this one before...but how often do you see a 5.5 mile advance sign like this? Took this I-91 gantry picture outside of the Basketball Hall Of Fame in Springfield.